Those that follow my blog on a regular basis know that I have food intolerances and what doctors have labelled IBS .The good thing about these "intolerances" is that they aren't food allergies,and just cause me more stomache problems than anything else.I get bothered by alot of foods though and still am trying to figure it all out. I read alot of books on digestive problems and food. 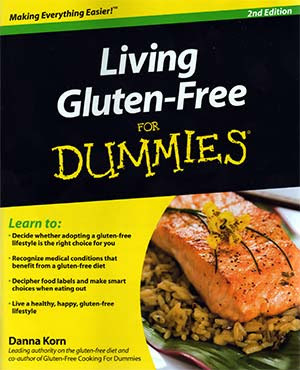 My latest book has been another in the Dummy series.They are just so well written and I love their books.This book is called: Gluten-Free Living For Dummies. Anyone that thinks they may have gluten intolerance or do, will want to get this book.The book covers alot of useful chapters. “More and more families are learning to go the gluten-free route, and it’s not just for those who suffer from the increasingly common celiac disease.” “Families everywhere are facing wheat allergies, gluten intolerance, and even autism—all diseases that are linked to the gluten we get from the food we consume. And more and more, people are taking the gluten-free plunge in the hopes of getting their families on the road to healthier eating.” The trick, author Danna Korn says, is learning how to substitute for a few staple ingredients in your kitchen. If you’re tempted to experiment with making your favorite recipes gluten-free, there are some savvy substitutions for a few of your favorite ingredients. A great and helpful book to have for any family with a member with gluten intolerance, or for those with questions about it.